TechLiner® can be placed underneath rigid high-sided liner to provide additional protection against paint damage. It is also ideal for users of truck caps and transporting pets. Installation takes only minutes, without the need for drilling or use of chemical applications. 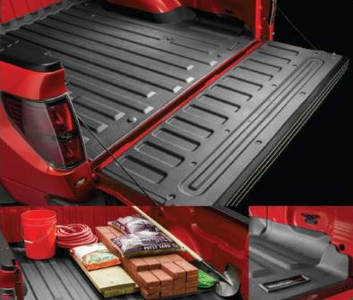 TechLiner® is secured to the truck bed with the use of Velcro® discs that allow for an effortless fit and the ability to remove the liner if necessary. Additional tailgate piece included.